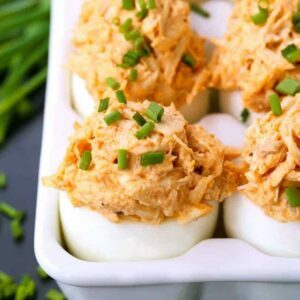 These Buffalo Chicken Stuffed Eggs are a super easy appetizer for any holiday! Make these stuffed eggs out for appetizers, lunch or just a low carb snack! Love eggs? 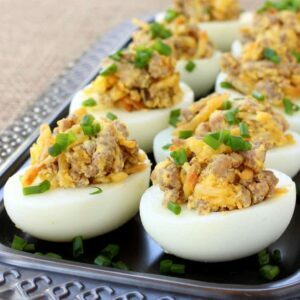 Try our Classic Deviled Eggs too or these Sausage & Hash Brown Deviled Eggs for a fun addition to brunch! Deviled Eggs or Stuffed Eggs? 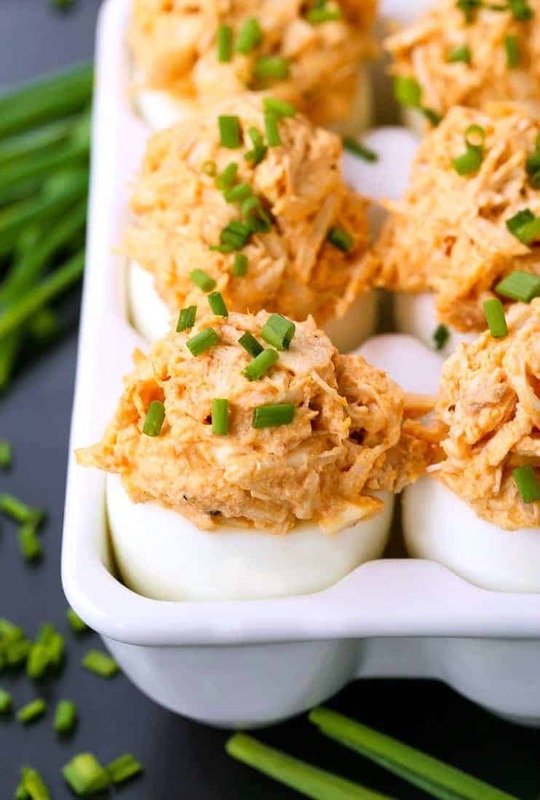 Not to be confused with deviled eggs…these are stuffed eggs. And it means just that. 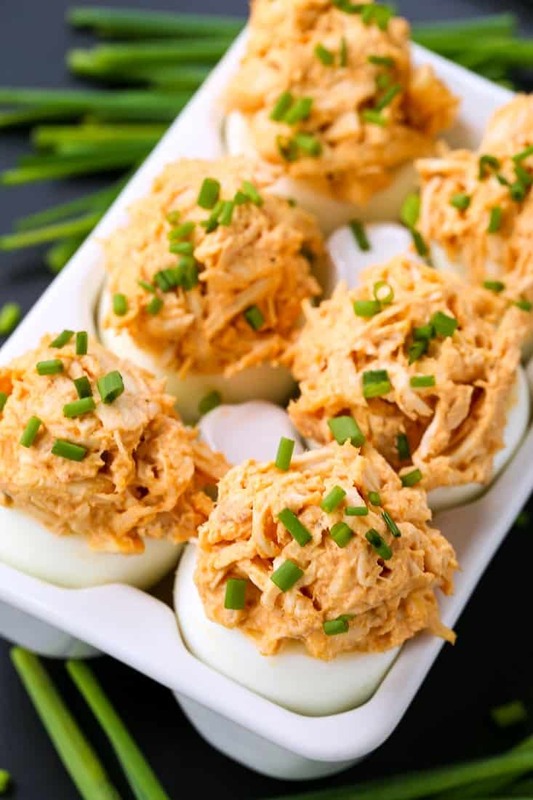 Hard boiled eggs stuffed with a buffalo chicken salad filling. Can’t go wrong with that! 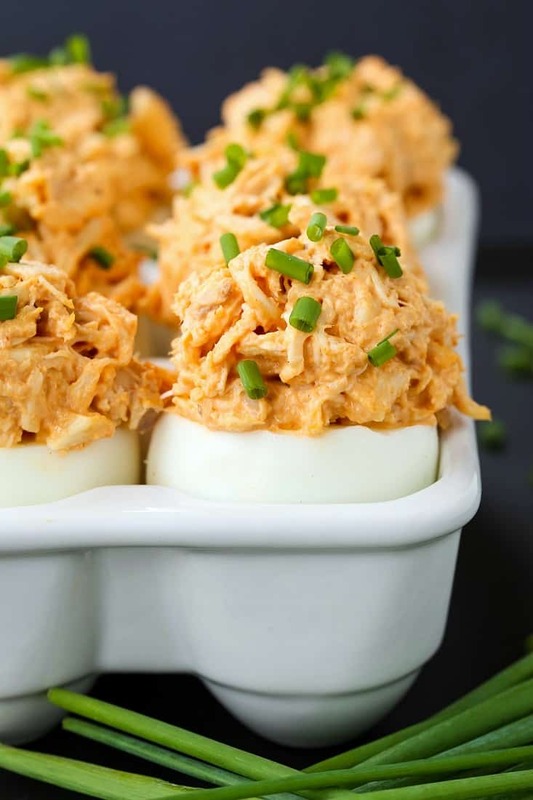 These Buffalo Chicken Stuffed Eggs are going to be a big hit for Easter appetizers, but we love making them for a low carb lunch, snack or even a light dinner! All you need for the chicken salad filling is chicken (a rotisserie chicken from the store works great here) mayonnaise, some seasonings and mild buffalo wing sauce. Let’s not confuse buffalo wing sauce with straight up hot sauce. 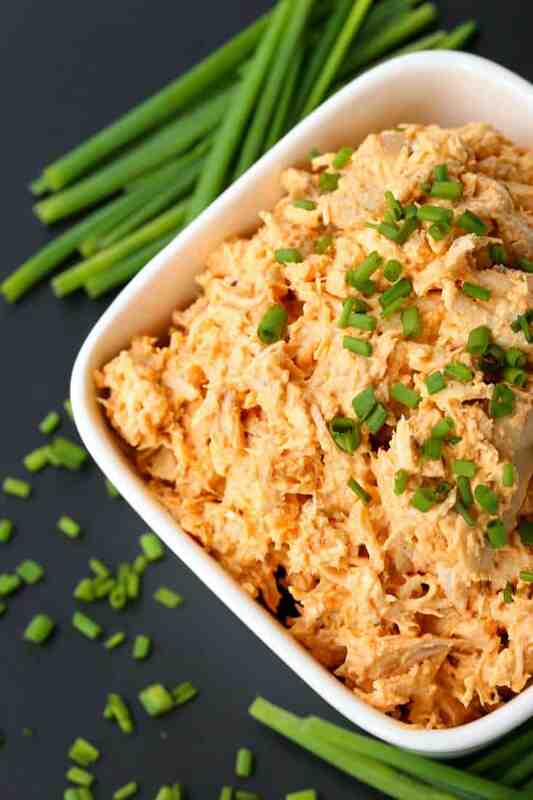 This is a mild buffalo chicken salad in this recipe, although you can spice it up as hot as you like it. A drizzle of sriracha on top would be totally appropriate. There’s a ton of different tips and tricks for making the best hard boiled eggs, where the shells just slips right off. I’ve tried a lot of them, sometimes they work great and sometimes not. So I purchased an egg cooker from Amazon (*product link at the bottom of the post*) that claimed to make the “best” hard boiled eggs. Well, it worked. 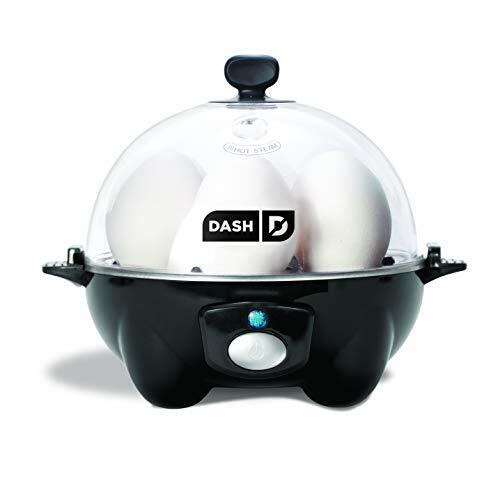 I’ve used this gadget, which is only about 20 bucks, time and time again and the eggs are always perfect! Our boys love eating hard boiled eggs too, so it’s great for when they want to make hard boiled eggs on their own, no worrying about boiling water or anything like that. All you need to do is cut off the top third of the egg, scoop out the yolk (it’s ok if some is left behind) and stuff the eggs with the buffalo chicken salad. You can definitely make these appetizers ahead of time, just keep them covered in the refrigerator until you’re ready to serve! 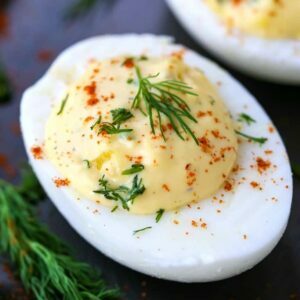 These delicious low carb stuffed eggs are perfect for appetizers, lunch or even a light dinner! Cut the top third off of each hard boiled egg and scoop out the yolks and save for another use. Mix the ingredients together for the buffalo chicken salad in a bowl. Stuff the chicken salad into each egg, then garnish with chives and serve. You can make these eggs ahead of time and keep them covered in the refrigerator. Thanks Daniel! Let me know how you like them! These are just too perfect. Can’t wait to try them out! 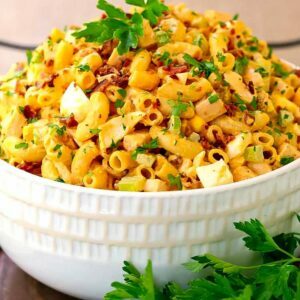 You have wonderful recipes! This is just genius, simply genius. I will be doing this next week for sure! Thank you Kristen – let me know how you like them! I really love how unique these are! Perfect for all the leftover Easter eggs I know we’ll have!